Steven Spielberg's huge-budget update of "The War of the Worlds," H.G. Wells' seminal alien-invasion novel from 1898, is a problematic blockbuster with one essential saving grace: It's profoundly frightening in a way that few directors have the talent to capture. I'm not talking about masked-psycho-with-a-chainsaw scary. That's kids' stuff. This is a slow, relentless, meticulous fear. It's the fear of uncertainty, the fear of grand-scale devastation that humanity is powerless to stop. It's a fear that fills the air like a storm and creeps up your spine in a way that's hard to shake. It is a fear not unlike what every American felt on September 11, 2001 -- but divorced from fact and realigned as entertainment through the subconsciously reassuring comfort of a movie theater seat and a tub of popcorn. 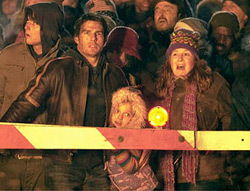 It's visceral, it's psychological, and it comes more from the terrified performances of Tom Cruise and the remarkable Dakota Fanning (the angelic 10-year-old from "Hide & Seek" and "Man on Fire") -- as a dock-worker deadbeat dad and his daughter on the run from 100-foot alien killing machines -- than from the film's hyper-realistic special effects and monsters (which aren't that different from the ones in the shamelessly corny "War of the Worlds" rip-off "Independence Day"). The film is worth seeing just to experience this fear, which is a testament to the power of cinema. Unfortunately, if you look beyond this seat-gripping scare factor and the spectacular imagery of the Earth under siege by towering, tentacled, three-legged alien tanks that fire building-leveling, human-crisping heat-rays -- if you look at the script and characters at its core -- this "War of the Worlds" starts falling apart from its opening voice-over. One of the few elements lifted directly from Wells in this adaptation written by David Koepp ("Spider-Man," "Mission: Impossible"), the book's first sentence (as read ominously by an uncredited Morgan Freeman) doesn't make a scrap of sense when removed from its 19th century context: "No one would have believed in the first years of the 21st century that this world was being watched keenly and closely by intelligences greater than man's..."
Huh? In 2005, everyone in the civilized world could easily believe aliens might be watching us. The notion has been a part of our pop culture since, well, H.G. Wells -- and the passages read from the novel that bookend this film are conspicuously incongruent with everything in between. Koepp and Spielberg cherry-pick what they like from Wells' story (the aliens are no longer from Mars), but many of their changes result in gaping plot holes, like the fact that the hundreds of thousands of the giant, high-tech extraterrestrial "tripods" have supposedly been buried on Earth for millennia. How is it that not one of these things has ever been unearthed by thousands of years of erosion, plate tectonics, excavation and construction -- or detected by modern, ground-probing sonar equipment used to find fossils and oil? Why didn't the aliens stay here when they brought all this equipment in the first place? Do they just go around the universe burying weapons on planets they might want to invade someday? Apparently so, and in this movie, the aliens return in what appear to be massive lightning storms all over the world, including in the blue-collar neighborhood where Cruise's ex-wife (Miranda Otto) has just dropped off her kids (Fanning and a petulant teenage brother) for a visit with their selfish, irresponsible dad. When the inevitable panic ensues, Cruise must learn typical Spielbergian lessons of fatherhood (the director's films often revolve around characters with major daddy issues) while spiriting his children to safety. Despite the logical gaffes (and there are many, many more) and the heavy-handed emotionalism, Spielberg keeps a tight grip on the film's nail-biting atmosphere by never leaving his central characters' points of view. There is no B-story here about the military battle raging just over the next hill as Cruise and family flee in the opposite direction, and the invasion is all the more distressing and disorienting as a result. (This is not unlike what M. Night Shyamalan did in 2002's "Signs.") But by the same token, this often leaves Cruise's emerging parental responsibility standing between the audience and the action. This "War of the Worlds" is further undermined by Spielberg's preposterously sanguine last scene and by Wells' original finale, which works perfectly on the page (and which was at the cutting edge of science 100 years ago), but is anti-climactic in a Hollywood "event movie" -- especially when it has to be explained in Freeman's florid closing narration before the ending becomes clear. Steven Spielberg's masterful filmmaking (his blend of modern special effects with stylistic homages to classic science fiction films is just what this material called for) and the picture's resulting power to twist your gut in a knot are not enough to overcome the flaws of "The War of the Worlds." But they are enough to distract you from those flaws long enough to have a goosepimpling good time at the movies.